Calling all Star Wars super fans! We know there are a lot of you out there and we sure hope that you’ll love this party as much as we did. 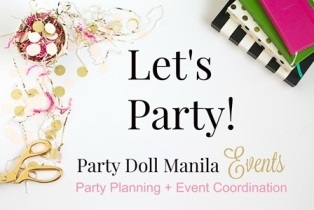 Thanks to NY Giftworks who styled this lovely fete with a brimful of extra cute details, I’m grinning from ear to ear due to the kick-assness and adorableness of Erlyn’s party. You see, this party is quite special because this little girl is the daughter of Mek, the boss babe of NY Giftworks. The team pulled out all the stops to make this bash swoon-worthy from the moment the guests entered the venue until they left. Every area is sure to impress with elements that are on point! If you have a great obsession with Star Wars then be sure to check out some of the most creative party ideas inspired by George Lucas’ sci-fi saga! The wowness begins here. With a couple of Stormtrooper guarding the entrance, this gave their guests a sneak peek of how the party will look like – 100% pure fun with a dash of chicness. Black swags and hanging stars were used to give the party an awesome galaxy-like ambiance. The force is strong with this one, see how adorbs their stage setup is. Featuring a Star Wars-ified Erlyn, the set also comes complete with BB-8! With a chock-full of Star Wars-themed knickknacks, from the table runners, plushies and glittery stars, their table setup nailed this theme perfectly. They even have themed activity sheets for the kids! These little morsels of yumminess look so awesome! Starting off with this epic cake, I love how every topper was amazingly sculpted and looks too cute to eat. That Erlyn fondant topper, oh man, totally cool. Star Wars themed Oreopops, rice krispies , cupcakes, cakepops, cookies and a whole lot of sugary treats by Sweet Creations by Mums were wonderfully offered for their guests to enjoy. I’m sure their guests can’t stop with just one. No Star Wars party will ever be complete without the characters making their special appearance. For Erlyn’s bash, their party hosts were suited up nicely in connection with the theme. Even the kids got their own Jedi cloaks and lightsabers to really get into the Star Wars spirit. Spotted several foodcarts plus a kiddie salon to make sure every guest was having a great time at the party. Guests were also invited to strike a pose in this lovely photo-op wall and have their photos printed as souvenir during Erlyn’s special day. This installation also showcased some of Erlyn and her family’s pretty photos. Check out these Star Wars-themed prizes and party favors. I want! Here are some of my favorite photos of Erlyn and her family. PS: Looking good, Mek!